How can a person love something so much and know so little about it? For example, I love chocolate. In just about all forms. But what did I know about it, other than the way it makes me feel when I let a small square of it melt slowly in my mouth, how it calls to me when I know there is some chocolate in the house and it’s just what I need to have a taste of right now? It can be bitter, but so can I. It can be sweet, and so can I. Would a close examination of how chocolate is made temper my taste in some way? It was time to find out. Photo by Molly DeCoudreaux Photography. 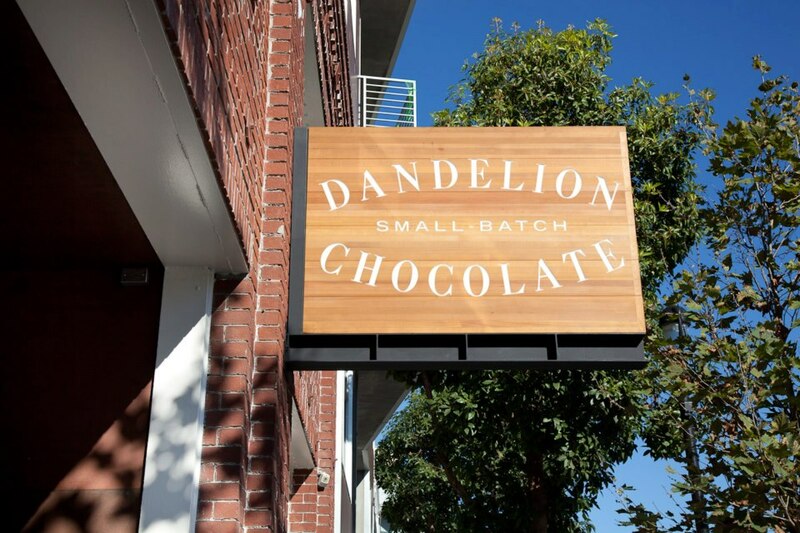 Making chocolate in small batches is a thing now, but until I happened upon Dandelion Chocolate in San Francisco’s Mission District, I hadn’t considered the possibility of learning firsthand about what goes into making the object of my desire. 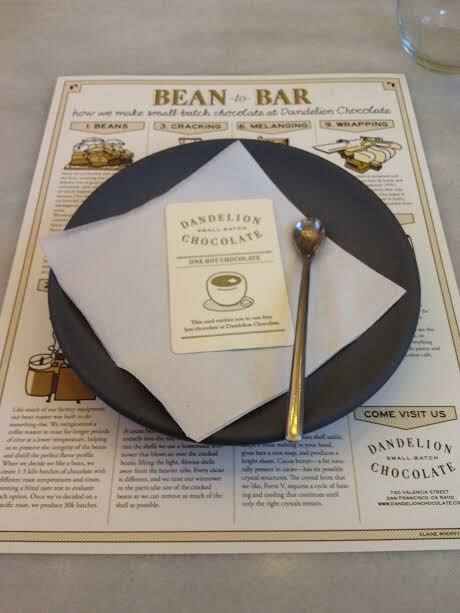 As I would find out in my Chocolate 101 class, making chocolate is a multi-step process; I learned just how many steps it takes to create an out-of-this world bar of chocolate during an evening’s fact-filled tasting session and tour at Dandelion. You could call it a hands-on class with benefits. 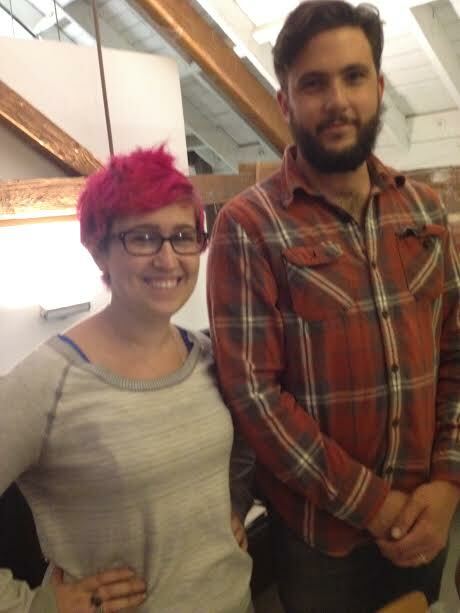 Christine and Maverick, Chocolate 101 instructors at Dandelion. Credit: Photo by Risa Nye. “Change is afoot and we are proud to be part of it. Launched in garages and kitchens around the country, the New American Chocolate Movement is giving Europe a run for its money as small-makers everywhere are searching for the one thing that’s been missing for a long time in the chocolate world: flavor.” Christine and Maverick, our Chocolate 101 instructors, told us what’s happening with chocolate these days is like what happened with coffee 20 or 30 years ago. The small batch chocolate makers today focus on “the nuance” of beans. The growing nationwide industry is inclusive, they said, with a free exchange of information and a sense of learning together how to produce the best flavors. Credit: Photo by Risa Nye. And nuanced flavor is what Dandelion seeks in its chocolate bars, searching the world over for areas that produce the most interesting beans. 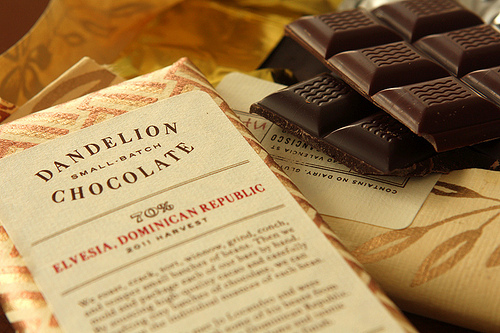 Starting with beans from Venezuela, Belize, Madagascar, Papua New Guinea, and elsewhere, Dandelion crafts what are known as “single origin chocolate bars.” They borrow the language of wine and coffee, which makes sense in terms of the distinct flavor profiles in each place of origin. The smallest details are attended to in the process from bean to bar – not to mention they even carry a modest selection of the highest quality espresso machines for your home that I’ve ever seen – definitely a place to pick one up. Selection comes first. 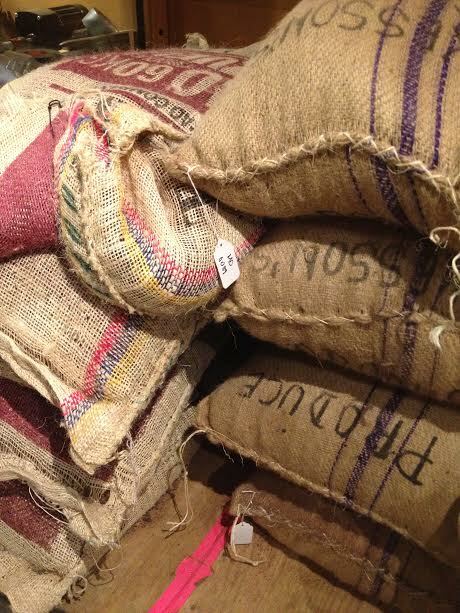 Choosing just the right beans involves another hands-on process, since many get discarded during the initial sorting. Then comes roasting, cracking, winnowing, melange-ing (grinding), blocking, tempering, and finally, wrapping, and — for the lucky students in my class, and the customers around the Bay Area and beyond — tasting, savoring, and enjoying. Up front in the Valencia Street factory, you get a sense right away that Dandelion treats chocolate with reverence: the bars on display are hand-wrapped in Willy Wonka-esque gold foil, then wrapped again using a Rube Goldberg-like machine named Hansel. The Hansel is fed paper (made from recycled cotton fibers) that is handmade and hand printed in India. Each bar looks like a special gift. Chocolate 101: Our instructors shared their vast knowledge of this whole process with an eager group of chocolate aficionados on a recent Tuesday evening. I could tell immediately that this was a true upper division class. Others around the table successfully called out the items we tasted in the small bowls set in front of us. Nibs! Cocoa powder! Cocoa butter! Vanilla bean! And soy lecithin — which looks like crumbled egg yolk and acts as an emulsifier in chocolate. Caption: Photo by Risa Nye. On to more tasting! 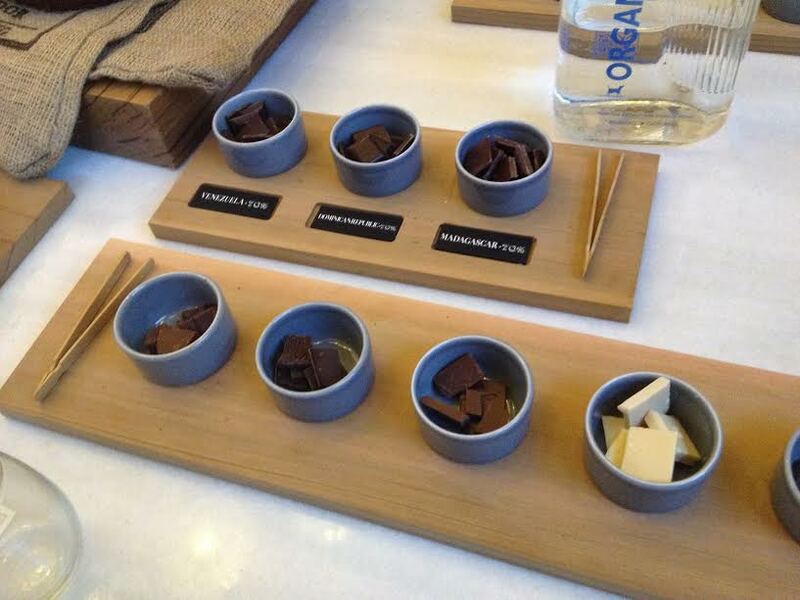 And this time we were asked to guess the percentages (the percentage describes how much of the bar is composed of ingredients made from cacao), and what other ingredients had been added to our samples—all from other chocolate makers. (Note: Dandelion uses only cacao and cane sugar in their chocolate.) And this is where members of my group stepped up: they were such good guessers that I decided to duck my head and busy myself with my notes while nodding in agreement. Of course this one is 58%, with organic cane sugar, whole milk, cocoa butter and sea salt! With the next one, I actually could have guessed the secret ingredient: goat’s milk. Not my kind of taste, but others liked it. Easiest might have been the 100% bar we tasted: as bitter as baking chocolate, with just cocoa beans and lecithin. 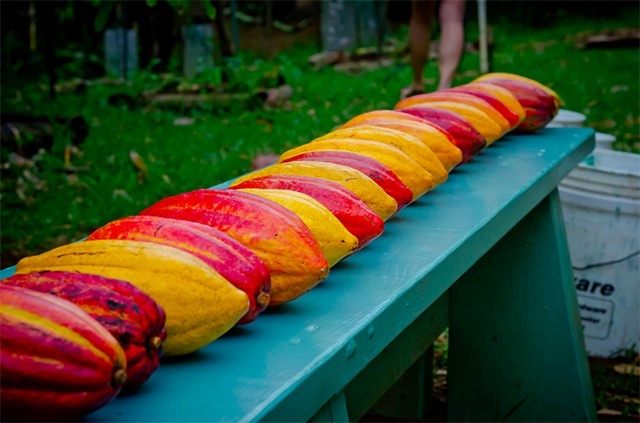 Cacao pods of many colors. Credit: dandelionchocolate.com. After the tasting session, we put on attractive paper protective hats and were taken into the temperature-controlled room where the beans are stored and sorted. 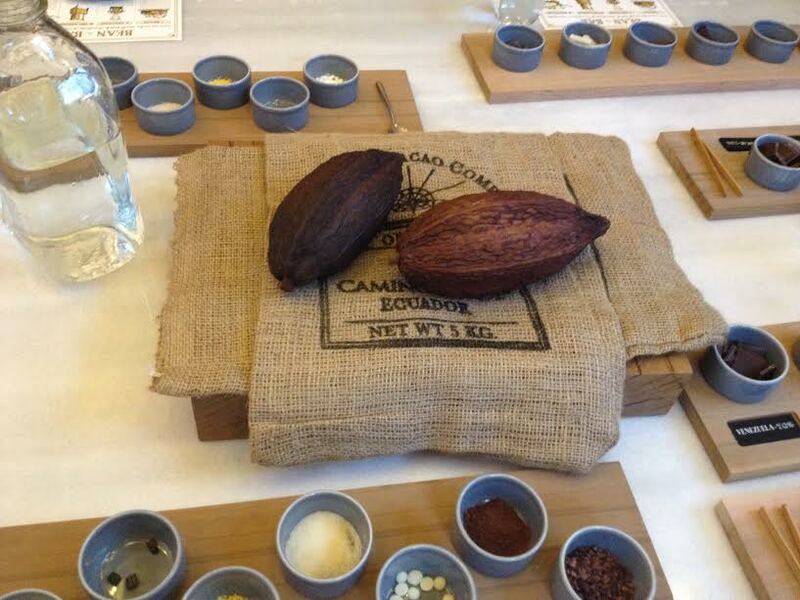 We tasted the mucilage (“tropical slime”) which is found around the cacao beans. It doesn’t sound especially appetizing, but had a pleasant, if unusual, taste. We looked at a series of photographs showing how the cacao pods are harvested from the trees and split open with machetes. The beans inside (which are white and look like kernels of corn) are spread out to ferment. It’s a slow process that has to be done at the site of the harvest. The beans must be dried to stop the fermentation process before they rot. Timing is everything. Once the beans are dried, they are packed in bags and shipped in containers. Then the winnowers go to work sorting, during which many unsatisfactory beans are discarded — a labor intensive process. I was fascinated with the machinery at Dandelion, and impressed with the innovative way they’ve taken equipment designed for other purposes (sorting hops, for example, or grinding nuts, or roasting coffee beans), and tweaked, repurposed or modified them to suit the needs of a chocolate maker. They have also created hybrids from machine parts that were never designed to make chocolate. 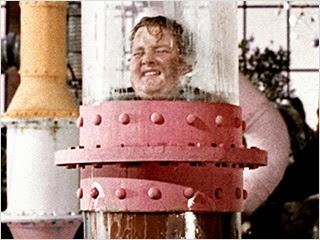 My favorite machine is definitely the one labeled “Cocoatown,” where I was reminded of the irresistible urges of Augustus Gloop in Willy Wonka and the Chocolate Factory. Did not touch, but was very tempted. The nibs spend several days in these melangers, where they are ground down with sugar, and, once the correct particle sizes are reached, the mixture begins to look and smell like chocolate. 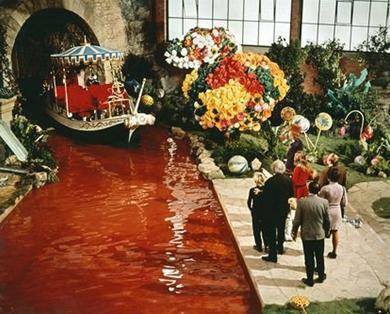 A chocolate river tempts Augustus Gloop to take an ill-fated dip in Willy Wonka and the Chocolate Factory. I asked who first figured out that something wonderful existed inside the strange-looking pods that hang oddly from trees. Maverick says the people of Central America have been processing cacao “from time immemorial.” Products of the bean were only consumed by royalty or members of the priesthood. In the Aztec culture, he said, cacao was used as currency. So, only the wealthy could afford to “drink money.” The beans were fermented, dried, and heated with cinnamon, honey, and other ingredients. The crème de la crème — froth — was created by pouring the liquid chocolate mixture from one vessel to another. Legend has it that Montezuma drank about fifty cups of foam a day. We can only imagine the effect this must have had on him. 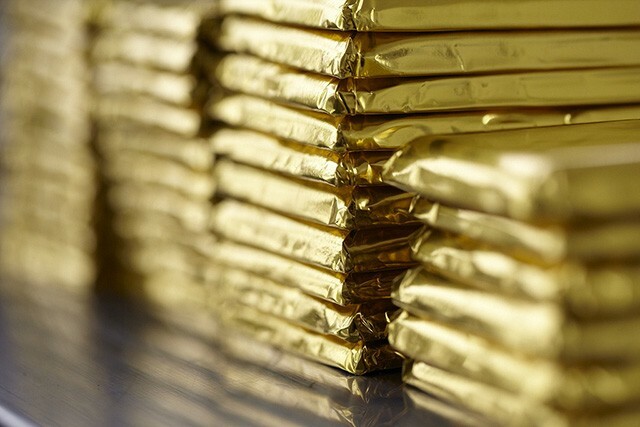 My evening’s experience at Dandelion left me with a sense of reverence for the gold-wrapped bars I couldn’t resist bringing home. Each tiny square of Madagascar chocolate takes me on a short journey, from bitter to fruity to heavenly. It’s a trip I’ll take again and again. For more information about classes and tours at Dandelion, check the website. 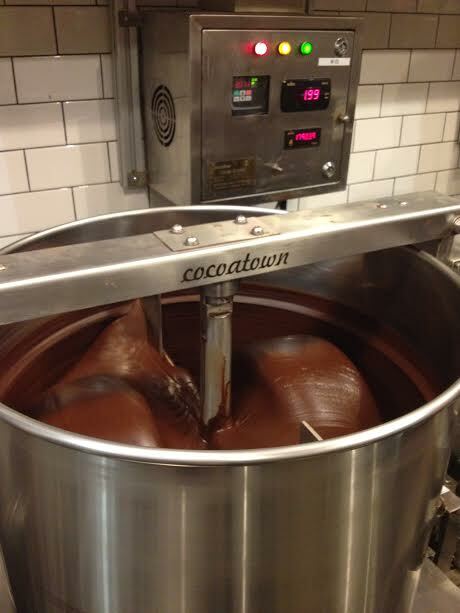 If you’ve always wanted to try your hand at chocolate making, think about attending Chocolate 201. And if you want to go see for yourself how the process begins, explore the field trip options listed under Chocolate 301 and 302. Recipe courtesy of Dandelion pastry chef Lisa Vega. Caption: Photo by Carrie Vasios Mullins/Serious Eats. Place the first chocolate and butter in a medium-sized bowl over simmering water and allow to melt — be careful not to overheat (96-98° F is ideal). In a second bowl, whisk the sugar, eggs and vanilla extract—this mixture will also need to be placed over simmering water. Whisk until it is just warm to the touch and then mix it into the melted chocolate/butter. 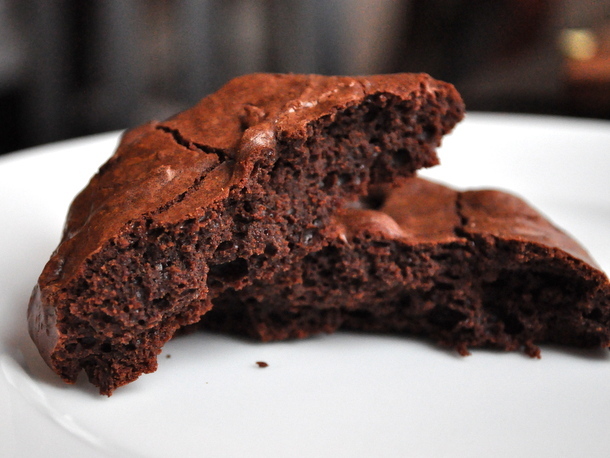 Combine the flour, espresso, baking powder and salt—whisk until just combined, and fold it into mixture. Scoop cookies (we use a 2oz scoop for larger cookie) onto parchment or Silpat-lined baking sheet and bake for 8-10 minutes at 325° F.
This entry was posted in Columnists, Eat, Eat: Recipes and tagged chocolate, Dandelion Chocolate, Dandelion Double Shot Chocolate Cookie, Eat, Lisa Vega, Risa Nye. Bookmark the permalink.